Vodafone mounted in 2008 a major advertising campaign to promote their new, competitive call plan that eliminates cross-border tariffs for calls to countries belonging to the “Vodafone One Nation” group. 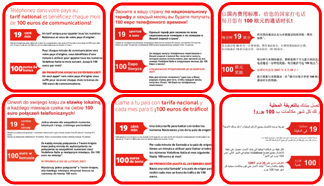 The advertising campaign called for the translation of brochures and call centre voice messages into eight languages (English, French, Spanish, Polish, Arabic, Russian, Romanian and Chinese) to explain Vodafone’s new promotion to its selected target market. The next step was a massive advertising campaign in fourteen languages in the local/ethnic press. QUALITY: The translations had to be in an appropriate advertising style. The payoff had to have the same level of effect as the original Italian text while respecting the culture of each target ethnic group. TIGHT DEADLINES: Agostini Associati carried out the translations and related checks within the tight deadlines agreed with Vodafone. TELEPHONE SUPPORT & CONSULTATION by Project Managers and native speaker translators before, during and after translation of the advertising campaign (text for the paper brochures, and IVR (Interactive Voice Response) texts for the telephone voice messages). ADVERTISING TRANSLATIONS and cultural adaptations, with a team of native speaker translators for the eight versions: English, French, Spanish, Polish, Arabic, Russian, Romanian and Chinese. All the native speaker translators had at least 5 years’ experience in translating advertising content for multinational corporations. After translation the texts were checked by reviewers who rigorously conducted 12 quality checks, guaranteeing the highest possible quality within the deadlines required by Vodafone. PROJECT MANAGEMENT services were available, including outside office hours. PAGE LAYOUT according to Vodafone’s specifications, to keep the layout the same as the original Italian. PROOFREADING after graphic layout, to check accuracy and completeness of the texts.